Glass bottles, dinnerware and glassware, ceramic material, CFL and fluorescent and incandescent light bulbs. No glass will be accepted due to possible contamination of other materials. Styrofoam and packing peanuts, plastic utensils, plates, disposable baby and adult diapers, garden hoses, landscaping plastic and tile material, PVC pipes, CDs and DVDs, plastic tarps, feed and seed bags and medical supplies and sharps. Food waste, dirty paper plates and napkins, frozen food boxes, juice boxes, paper towels, tissues, toilet paper and wax paper. Clothing, shoes, pillows, blankets and rugs. Computer monitors, towers, printers, copying machines, and TVs. We have a separate area for this and there is a fee charged for these items. Any items that have a rechargeable battery is not recyclable due to fire hazards. 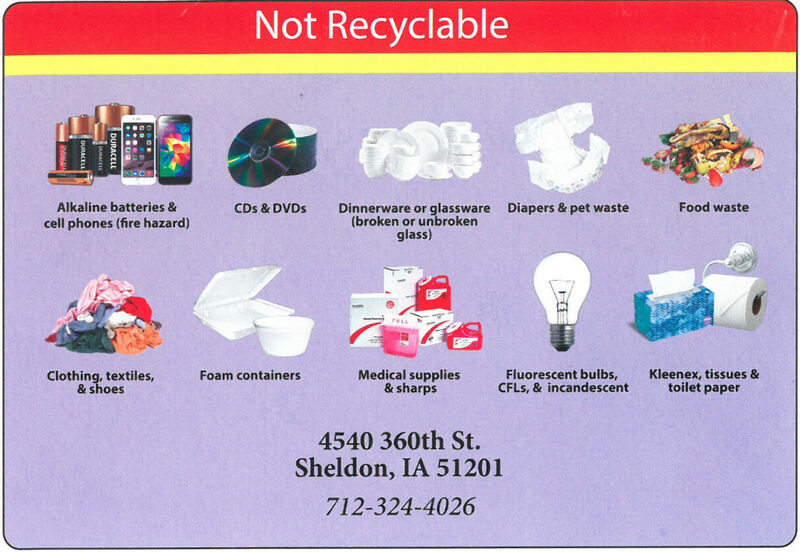 CFLs, fluorescent bulbs, batteries, and cell phones are accepted at the Northwest Iowa Area Solid Waste Agency Household Hazardous Material Regional Collection Center by appointment.